But seriously, while you can never have too many, according to some, how many do you really NEED? It's one of the most basic questions and one that must be answered in order for anyone to successfully convert to cloth diapers full time. First off, how many you need depends a lot on how often you want to wash diaper laundry, how many little ones you have in diapers, and how old they are. Newborns needs their diaper changed a LOT. I wouldn't hesitate to say that you could change a newborn or small baby's diaper up to 12 times a day, maybe more. They might not be filling their diaper at each diaper change but instead are doing a little squirt here or there, enough to warrant a change of diapers every time you turn around. Older babies and toddlers who are gaining more control over their bowel movements seem to begin to hold it more and go less often but in larger quantities than small babies. This means less diaper changes. At the very minimum I'd say you'd still need to count on having at least 6-8 diapers per day to be on the safe side. So I know what you're thinking "Multiply the number per day by how many days before washing and...voila! That's the magic number!" Well it's not always quite that easy. 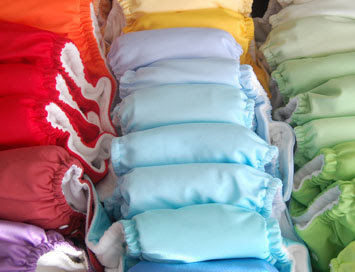 One thing you want to consider is that for most, cloth diapering is affordable and desirable because you want to have your stash of diapers to last through potty training and for future children. If you have exactly the number of diapers that you need to get you through a day then you need to think about the fact that those diapers will be being laundered almost 365 days a year! Now cloth diapers are not unlike your clothing, take a nice shirt you have, a quality made one, and wash it every day or so for 1,2,3 years and it's going to get worn out, there's no way around it. Do you have a magic number? How many diapers do you have and what are your thoughts on this topic? We'd love to hear from you! 36 is my magic number, I like to do laundry every 3rd day and with 36 I never run out even if I am a little slack. I started with 20 about 16mo ago and I'm now up to about 40! The great thing is that you extend the life of your diapers once you get more...my first set got used SO much that they are in need of some repair! I started with 12, and found that 15 ALMOST gave me enough if the baby didn't poo overnight to do laundry every day. Now, all totaled, I have, ummmm 75 (but realize that this includes quite a few sized diapers that are outgrown!) I wash my current ones in batches of 12-16, with an 18 month old is about every 2 days! Which means my magic number would be ideally be somewhere between 30-36! -- I use more than that, but I want my stash to last! I've seen plenty of places quoting 24 but I don't think that's enough to have them last!